Bruce Wayne needs to consult his engineers before he make his next leap. Otherwise he would soon become a messy afterthought for the street-cleaners of Gotham. According to a research paper published in the University of Leicester's Journal of Special Physics Topics, the impact of Batman's larger-than-life leap would be the equivalent of being hit by a car at 80km/h. Had he not died from the nuclear blast in The Dark Knight Rises, his own cape would've finished him. Sooner or later. The Batcape functions as a glider, enabling Batman to jump off tall buildings or even planes and land safely. But calculation shows that the 4.69-meter windspan--just half that of an ordinary hang glider-- is a crappy tool for landing. When launching off an 150-meter-high Gotham city skyscraper and gliding for around 350 meters, Batman’s velocity would peak at 109km/h before levelling off at a life-threatening 80km/h descent. 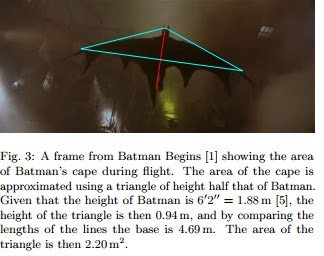 “If Batman wanted to survive the flight, he would definitely need a bigger cape,” suggested co-author David Marshall. “Or if he preferred to keep his style he could opt for using active propulsion, such as jets to keep himself aloft.--wired.com. 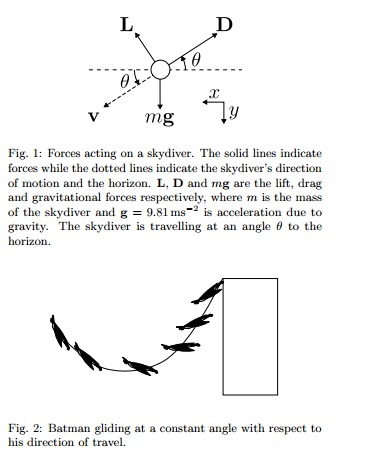 The paper concludes that gliding using a Batcape is not a safe way to travel, unless a method to rapidly slow down is employed. A parachute, for instance. That's so tragic, Batman. I mean, seriously, parachute?